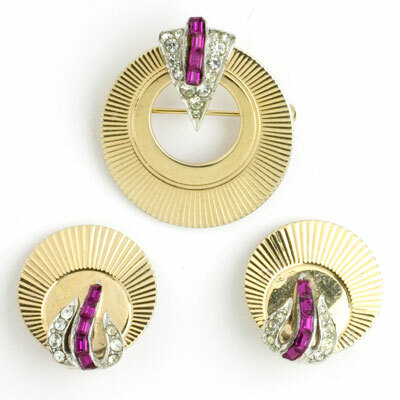 This nice selection of costume jewelry sets (also called parures) is from the 1920s-1950s. 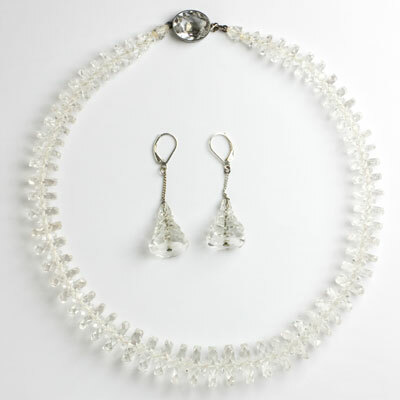 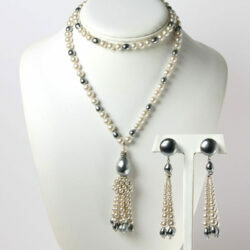 Each set has a necklace, bracelet, or brooch with matching earrings. 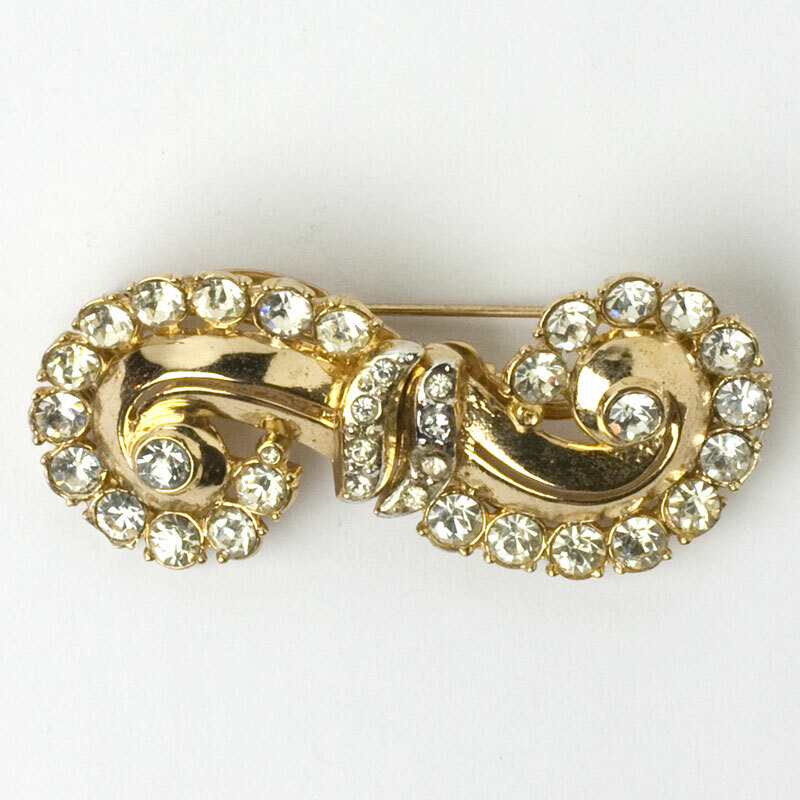 Parures were particularly popular in the 1950s, when matching accessories (hats, gloves, belts, shoes, and jewels) were in vogue. 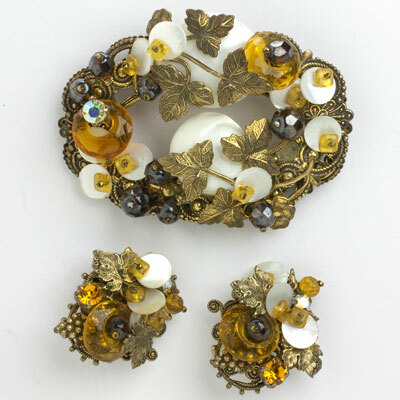 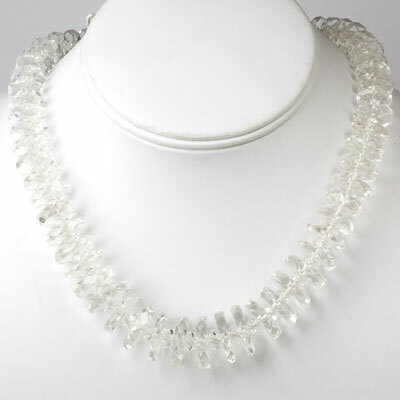 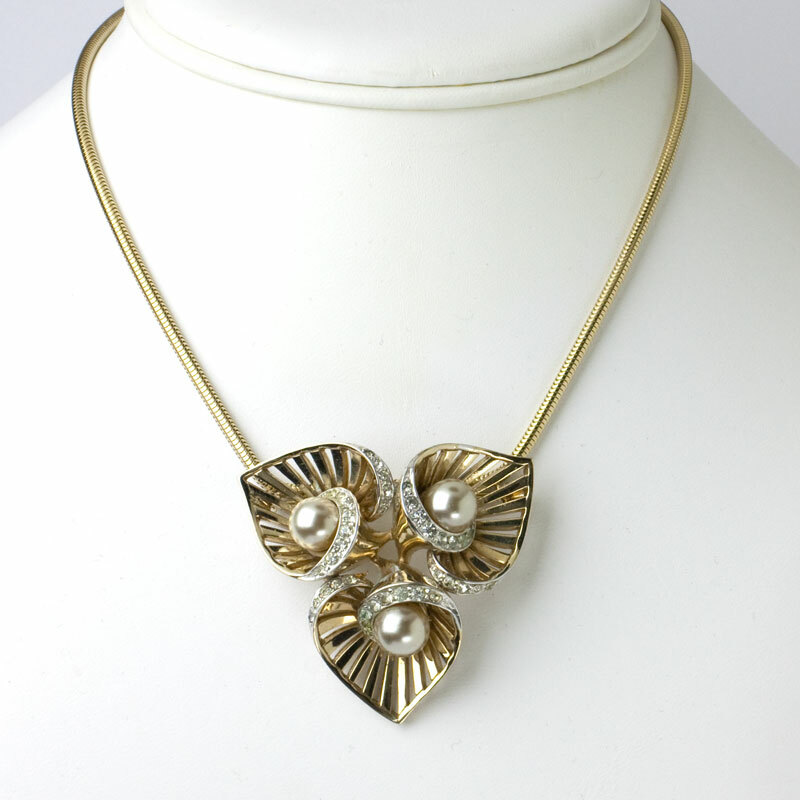 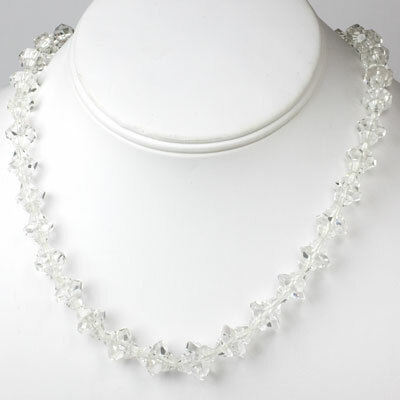 During that decade, a full parure might have included a necklace, brooch, earrings, and a single or pair of bracelets, which a woman would wear at the same time. 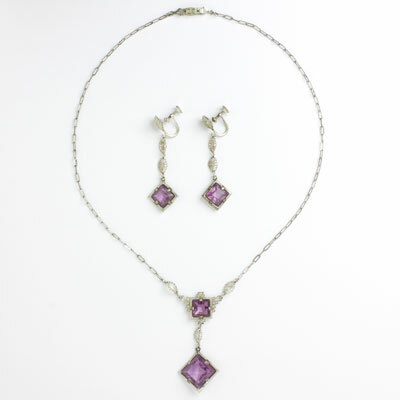 With today’s fashions, we tend to dress down, so you can wear the pieces in these sets together or separately. 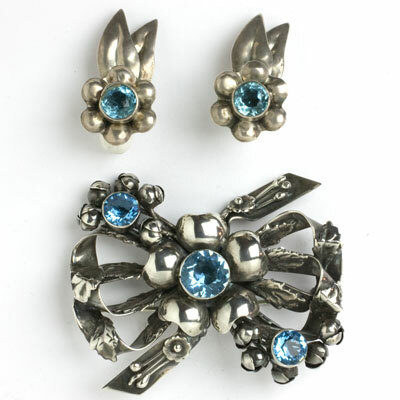 You can also combine one part of the set with complementary contemporary jewelry already in your jewelry box. 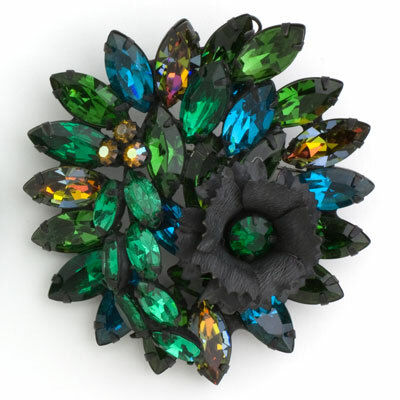 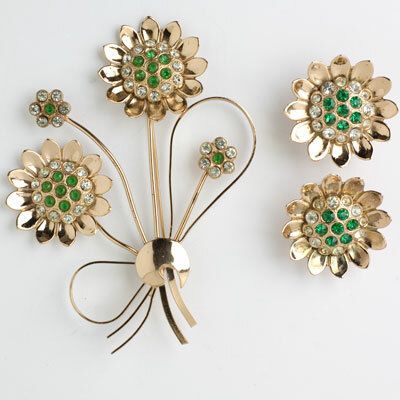 Layers of emerald, sapphire and golden topaz glass stones are combined with black metal flower petals in this 1950s brooch and earrings set by Hattie Carnegie. 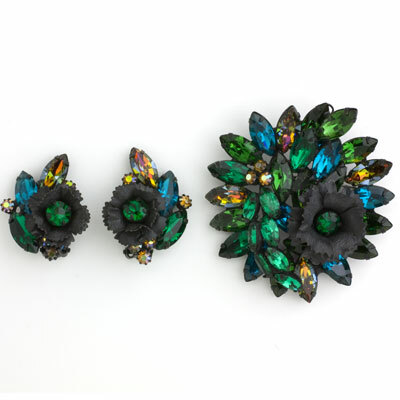 Some of the stones appear teal in color, depending on the light. 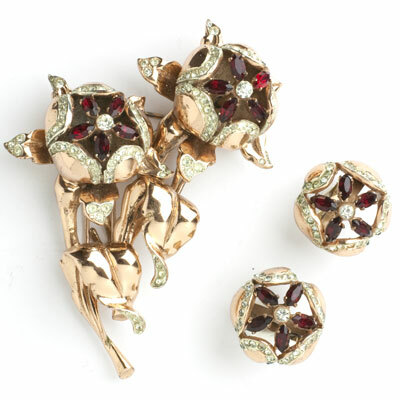 This set is a fine example of her imaginative color combinations, favored floral motifs, and complexity of design. 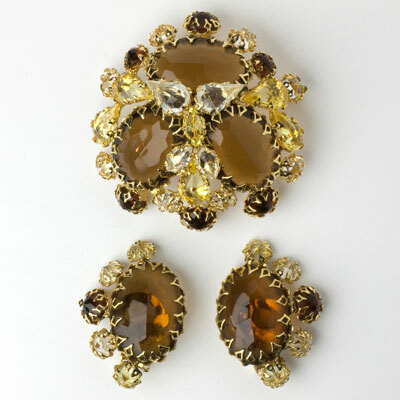 What a knock-out! 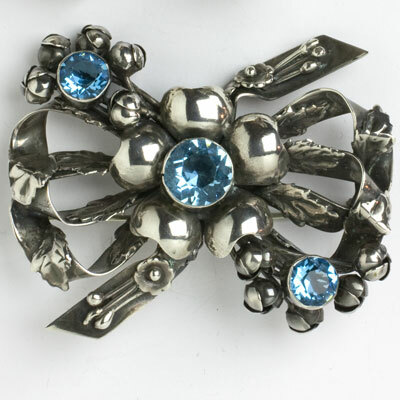 The settings are japanned metal, and the brooch has a roll-over safety clasp. 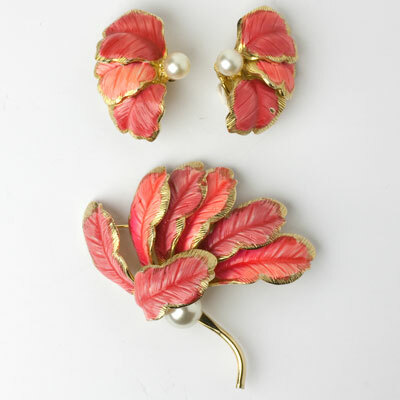 When worn, the ear clips face each other and beautifully frame your face. 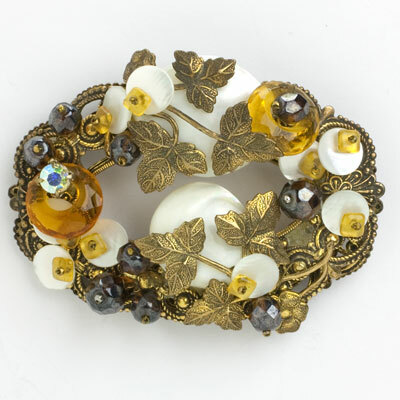 The last photo shows how fantastic this brooch looks on a dress sash. 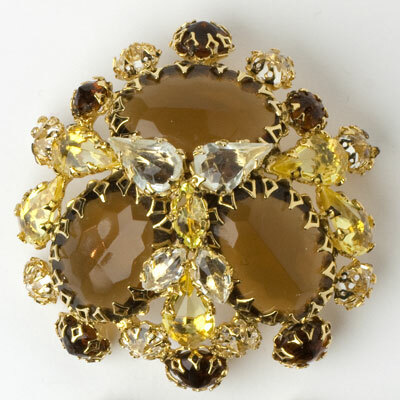 Although the brooch has a ring designed to allow the piece to be worn as a pendant, my expert jeweler advises that the ring is not sturdy and cannot be replaced without damaging the back of the brooch. 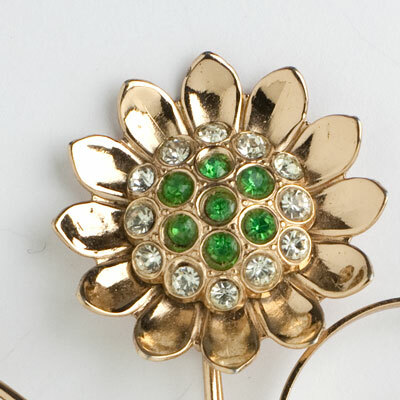 I don't see this point as a problem – I'm just mentioning it in the interest of full disclosure. 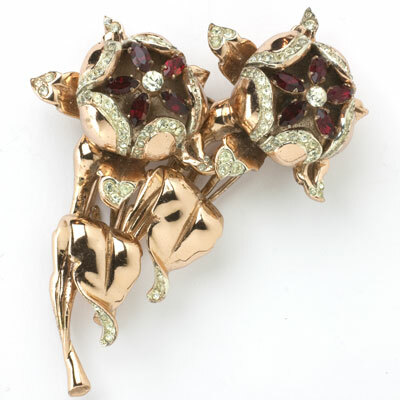 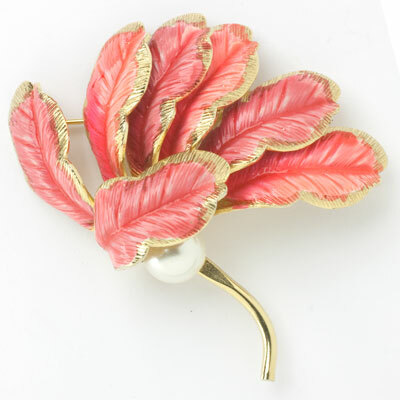 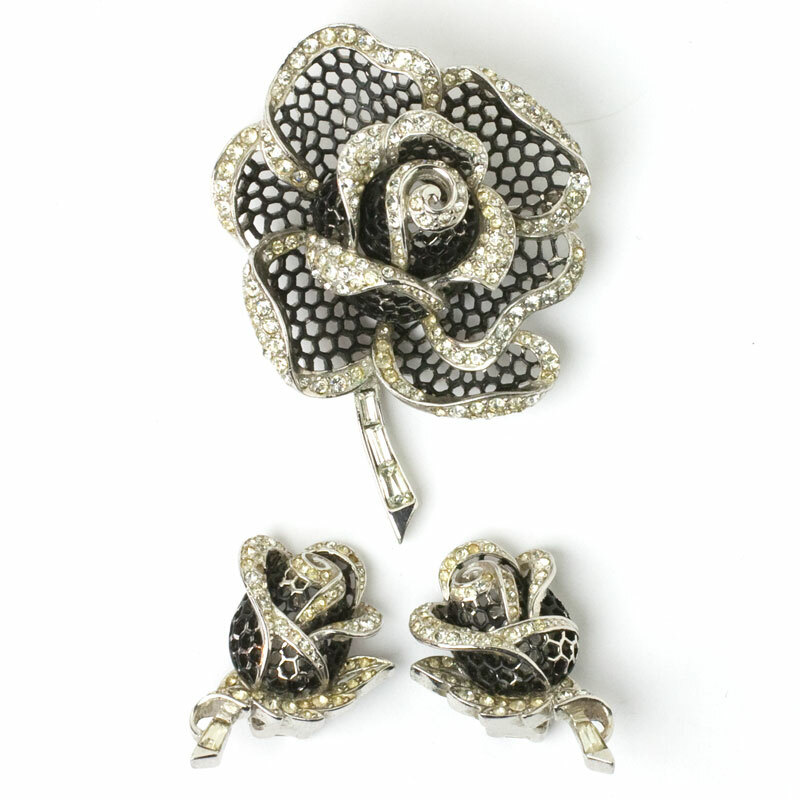 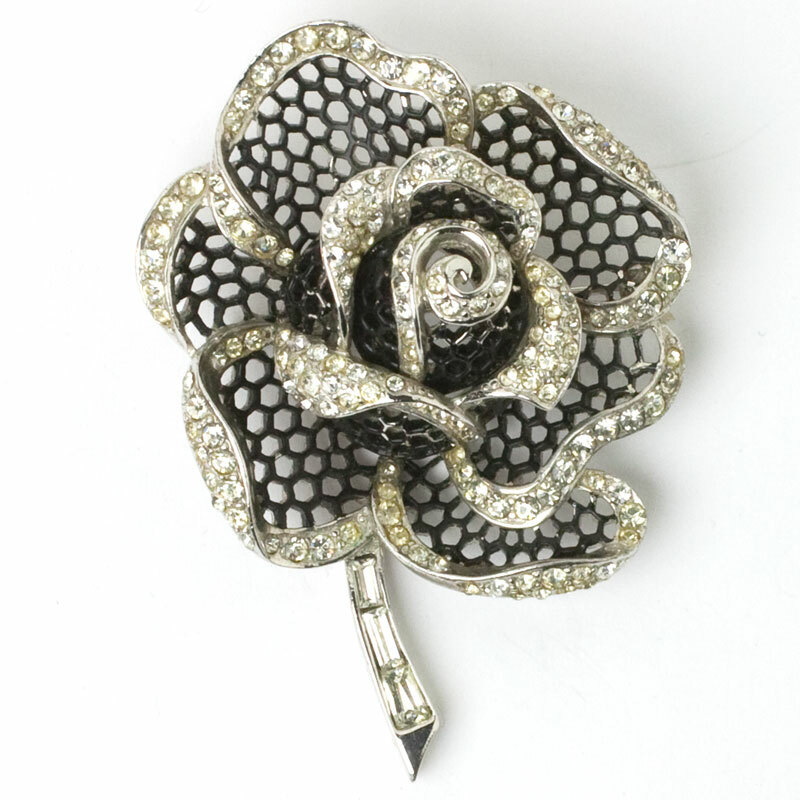 The brooch in this 1950s set by Marcel Boucher features a trio of heart-shaped blossoms. 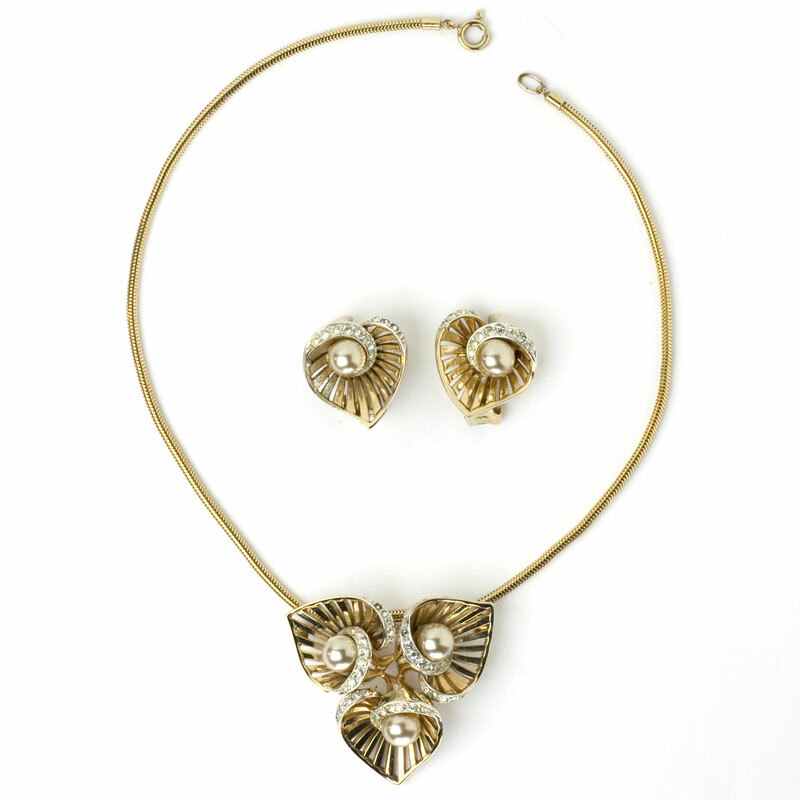 Their gold-plated fretwork has swirled pavé edges that embrace champagne-colored faux pearls. 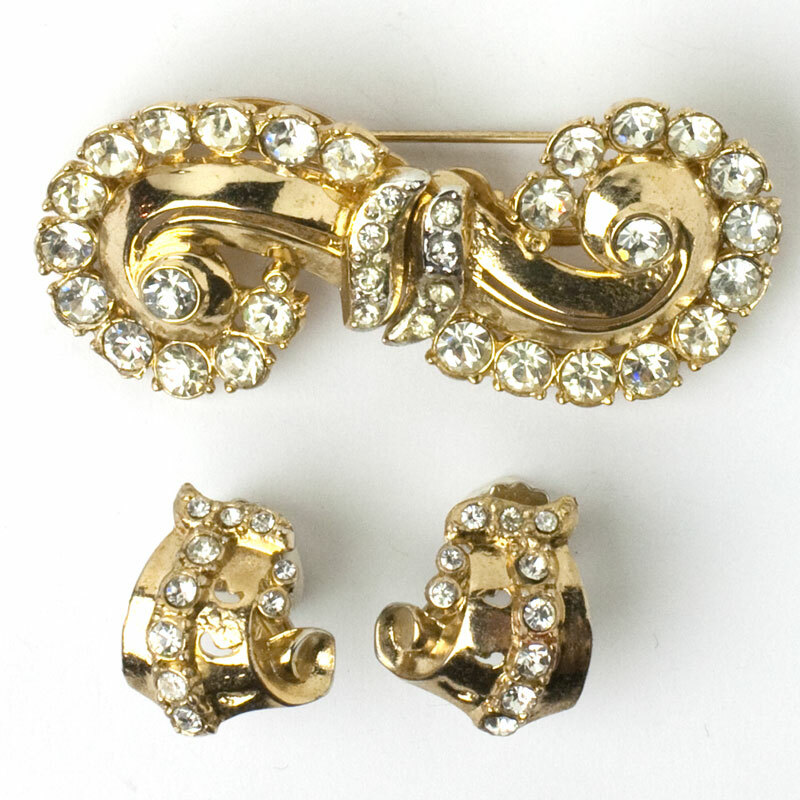 The ear clips are single hearts. 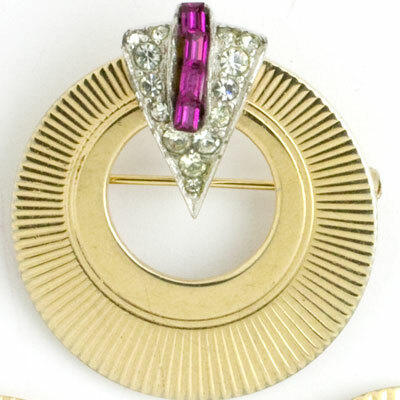 The brooch, which closes with a roll-over safety clasp, can be worn as a pendant by inserting the pin stem through the loops attached to the snake chain. 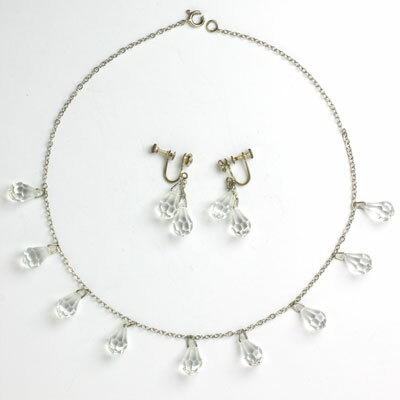 Pretty clever, eh! 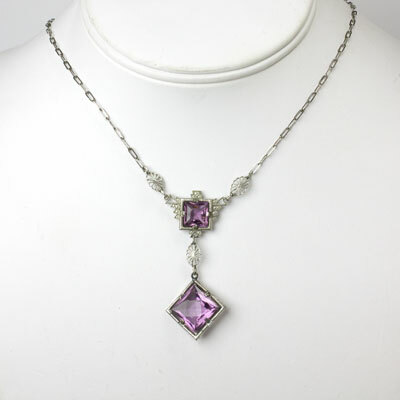 While the pendant appears slightly off-center on the chain, its position was fixed at manufacture, as the loops are attached to the chain. 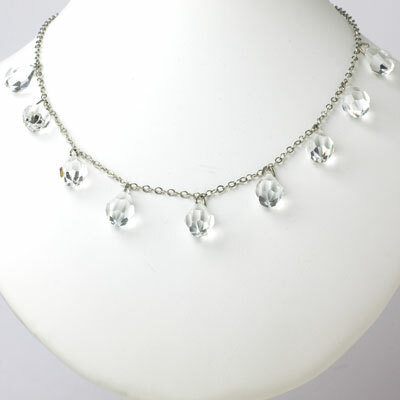 Please note that this necklace (which measures 14 3/8") was made for a slim neck, but you could easily add a chain extender.